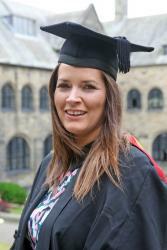 Having attained First Class Honours in her LLB Law, Victoria Ring, from Ffynnongroyw, will now undertake her professional training course at BPP University, Manchester, after which she hopes to specialise in land law, public law or trust law. Despite the obvious challenges of balancing her studies with motherhood, it was her four-year-old daughter Amelie, who suffers from cerebral palsy, who initially inspired Victoria to pursue a Law degree. “I had been studying an Open University degree in Religion and History before having Amelie, but gave it up shortly after she was born”, says 34-year-old Victoria, who is also mum to 3 year-old Louis and 18 month-old Emmeline. “I wanted to return to a degree that was challenging, and would equip me with the skills and tools needed for dealing with the various professionals we were seeing, such as doctors and occupational therapists. As well as developing these life-enhancing skills, Victoria has made the most of the opportunities that have come her way during her time at Bangor, describing them as “fantastic”. “During my second year, I won an essay-writing competition which led to a mini-pupillage with Linenhall Chambers. This was very insightful as I had the opportunity to shadow various barristers across a variety of cases, and the experience inspired me to want to be a barrister myself. A committed student to the end, not even the birth of her third child in December 2015 could distract Victoria from her studies: just weeks after Emmeline’s arrival, she sat her January exams alongside her classmates. Studying a Law degree has certainly opened up a world of opportunities for Victoria, most notably the chance to do her best by Amelie. Of her future career path, she notes: “becoming a barrister will enable me to pursue a career that I enjoy, and that will challenge me on a daily basis. “It will also equip me with the skills to deal with the many professional people our family interacts with, and to able to stand up for my Amelie’s rights and to secure the very best for her”.